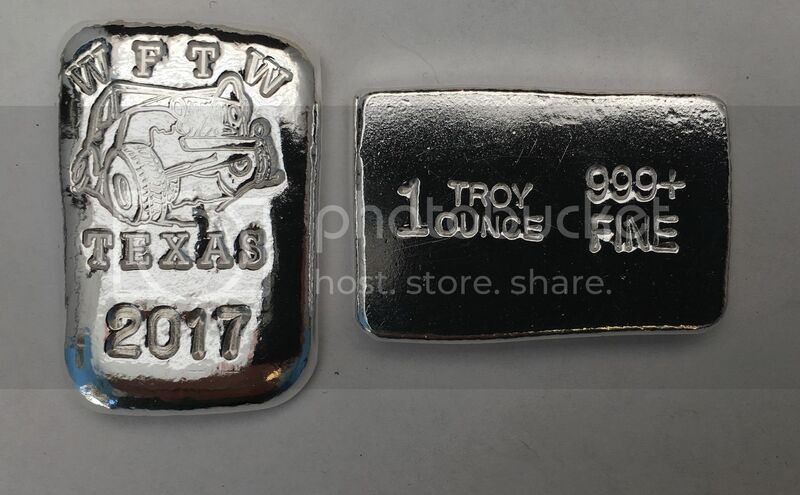 Once again we’re making silver bars to hand out to wounded soldiers at the WFTW main event. The bars will be like the one shown below. Once again, David will be making these bars for free. You might consider sending a thank-you note to David or picking up a couple extra bars from YPS. It takes a lot of work to make these bars and David always steps up. Thank you David! Please post the dollar amount of your donation in this thread and I will respond with details. YPS will be supplying the silver at cost, and payments will go to me. I will send the lump sum to YPS, so please don't send it to the WFTW. Your donation can be for any amount, and doesn't need to be tied to a certain number of bars. If you prefer to remain anonymous then please send me a private message. The main event is the weekend of May 6th, 2017 at Hidden Falls Adventure Park in Marble Falls, TX. All Bullionstackers are cordially invited to attend. We would love for you to come out and help us give these bars away. It’s a great way to meet these brave men and women and hear their stories. And we always have a little get together for BS members. Stacking in memory of R.W. With over 2000 members if each member would donate just $5 think what we could do for those that have laid it all on the line for this country. Last edited by Baggerman on Fri Mar 24, 2017, edited 1 time in total. How many soldiers received one last year? I was thinking it was over 100. Recluse wrote: How many soldiers received one last year? I was thinking it was over 100. There were 171 bars poured in 2016.